Put away those mittens and unravel your scarf: the HOT SALE is here to warm you up with deals you cannot miss. GOG.com has hand-picked more than 100 offers, featuring some of the bestselling games from the recent Winter Sale and are introducing the highest discount yet on The Witcher 3: Wild Hunt GOTY. On top of that, there’s a FREE game to be claimed right on the front page! Get DISTRAINT for free in the next 48 hours, till January 25, 2 PM UTC (claim it from the main page banner). If you want to follow Price on his next gloomy adventure, DISTRAINT 2 is out now and 20% off. 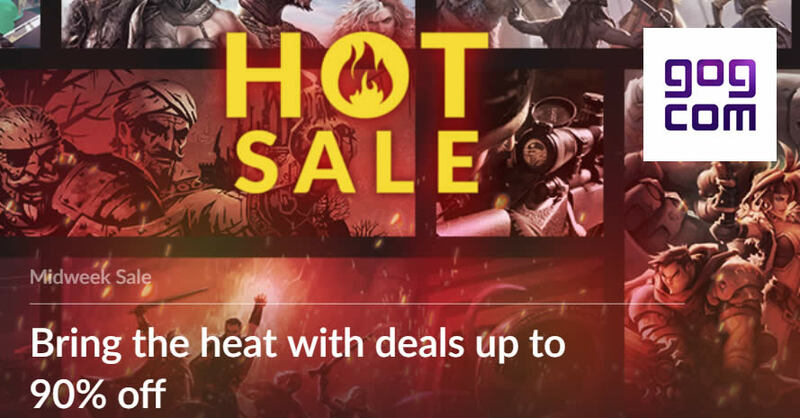 The HOT SALE features some of the most popular deals from the Winter Sale. If you’ve got lost in the Holiday frenzy and missed out on the tasty discounts, here’s your chance: Divinity: Original Sin 2 (up to -40%), Frostpunk (-33%), Pathfinder: Kingmaker (up to -25%), Stellaris (-75%), Kingdom Come: Deliverance (-50%), Darkest Dungeon (-70%), Hollow Knight (-34%), ELEX (-60%), Phantom Doctrine (-40%) and many more are back. Those looking for the hottest deal ever on The Witcher 3: Wild Hunt will have a good reason to smile – the Game of The Year Edition is now 70% off. Craving for more stories from The Witcher universe? Thronebreaker: The Witcher Tales is available with a -25% discount.